Apologies for pointing out the obvious, but boy is it HOT. Even as I write this, it's pouring down with rain and I could do with an ice cream sandwich ASAP. Much like my bodies need for ice cream during summer, my skin craves cooler, lighter products and if I ignore it I am rewarded with an overload of oil on the skin, beautiful. I've been tweaking my skincare here and there for a few weeks now and am finally at a point where I'm happy with my skin, it's definitely the best it's looked since before my acne-splosion - and I still have a long way to go, but I'm working on it! For once my main concern isn't acne, or even acne scars, but oil! I have noticed my skin is much oilier lately and have been trying to use lots of 'balancing' facial oils, masks and serums to combat that. A few new products have made their way into rotation and I'm really loving every single one of them. First up we have the Love & Roses Beauty Mist from Olivine, this was in my June Faves and for good reason, it's very soothing and cooling on the skin, and surprisingly moisturising, too. I spritz this onto a cotton pad each morning and use it that way, and in the evening I go ahead a spray it directly onto my skin. I can tell I've been using it lots as since this photo was taken the liquid is now level with the top of the 'L'. If you're looking for a rose water mist with a difference, I would definitely suggest this one, it has some fab ingredients to really boost it's properties and works great as a hair perfume, body mist/perfume and a omg-help-me-i'm-melting-cooling-mist during those nights when everything is just too hot and you can't sleep. Then there's the new Night Serum from Dr. Hauschka which is equal parts amazing and terrifying. What do you mean this is all you use?! no oil? no moisturiser?? But hold tight, it really works and is like a breath of fresh air for the skin in stuffy night time heat. The serum is a light gel and it has very simple ingredients; witch hazel, apple blossom extract and apple fruit water. Nothing too fancy or promising life changing skin when you wake. I like it. Dr. Hauschka recommend using this alone in the evening to let your skin breath and go about its own natural renewal process without the interference of heavy creams, oils and serums... but does it work? Well, I adore the feeling of fresh, clean skin in the evening and this keeps that feeling going all night for me, I also notice come morning that my skin is just fine, no blemishes, no dryness, no redness, just calm and normal. And isn't that the end goal of every skincare routine? This serum has also been great paired with the First Aid Beauty Facial Radiance Pads which I use instead of a toner every two or three nights. Like I said in my last post, I've been looking for a gentle acid exfoliator to add to my routine for awhile now and these pads fit the bill nicely. I haven't noticed any adverse reaction and I really think they've been helping with the texture and congestion issues I've been having. 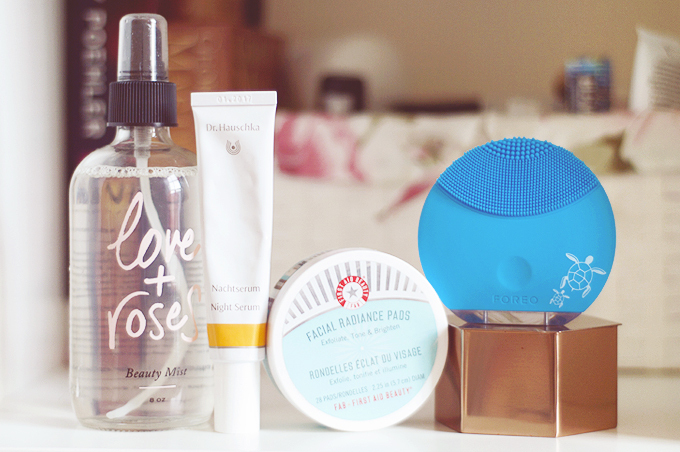 And finally, I've been saving the best for last... enter the Foreo Luna Mini! This little device has been part of my skincare routine for about three weeks now and I'm totally smitten and convinced this is the real reason my skin is only improving. I wasn't sure how I felt about this silicone cleansing brush, I mean, really? It's so strange. BUT, it works! It isn't harsh in the slightest, the little silicone bristles glide over the skin doing their magic and you're simply left with clean and softer skin, there really is a difference. I'm going to need to write a full in-depth review soon because I have so much to say, but just know you need one. Do you switch up your skincare for summer time? & do you have any recommendations for natural products to help combat oily skin? Throw 'em at me!